1. BUY NOTHING DAY is a holiday that is more important than Thanksgiving, Christmas, Kwanzaa, Ramadan, Hanukkah, and yes - even New Years? Why, you ask? Because the integrity of the ecosystems we depend upon for survival hang in the balance. Consumption - something Americans are better at than the rest of the world, requires production. Production requires resource extraction. Every product has to be dug up, ripped out, cut down, or gathered - it doesn't magically appear! Even greenwashed products, unless totally recycled or thrift, requires a piece of the landbase in some form. So on November 28th, let freedom ring - exercise your right NOT to go shopping! 2. A Breaking Investigation Reveals That Turkeys Were Stomped, Punched, and Kicked. With Thanksgiving just around the corner, do you really need to condone this by choosing to eat a big, dead bird? Really? What can you do about it? Don't pay the callous people who do this by purchasingthe body of a turkey this Thanksgiving. Instead - adopt a turkey! 4. 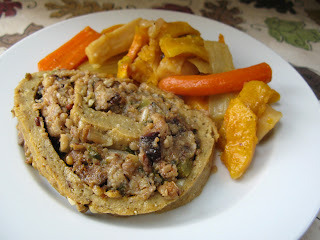 Emilie at The Conscious Kitchen has prepared some mouth-watering thanksgiving fare. If you need inspiration, she is your go-to gal for sure! 5. Where Does Donna Karan Stand On Fur? I love the new ad campaign from PETA that is being wheatpasted up all around Donna's office and apartment.